As part of our landmark 16-study series and ongoing work in measuring methane emissions, we previously published a paper that compared and reconciled top-down (airborne-based measurements ) with bottom-up (emissions inventory, using ground-based measurements) emissions. This paper found that 1% of natural gas production sites accounted for 44% of total emissions from all sites, or 10% of sites 80% of emissions; emission estimates were based on facility-wide (site-based) measurements. 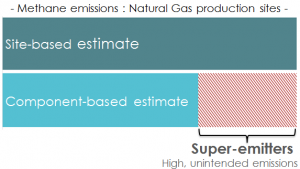 Sites or equipment that produce disproportionate shares of total emissions are often called “super-emitters”. A big question that remained was what caused some sites to become a super-emitter; this remained a “black box” without additional knowledge about which components or operational conditions within a site could trigger the high-emissions. In a paper published today in Nature Communications, we zero-in or “open the black boxes” to understand and characterize super-emitters. We look at the emissions from all the equipment and operations present at production sites, and ask which ones could produce emissions at a magnitude and frequency indicative of the expected super-emitting behavior. Crucially, this new paper compares site-based emission estimates to component-by-component aggregations of sources of emissions from production sites. We find that this new component-based emissions estimate is significantly lower (one third) than the site-based estimate previously reported in the Barnett synthesis study (where this site-based estimate agreed with the flyover estimate). It’s important to note that while the study took place in the Barnett because of the rich data sets available, this behavior is expected across the US (and even internationally). Component-based estimates do not explain enough high-emitting sites. From this we learn that some components or activities at production sites are causing wasteful emissions that are not accounted for in current emission inventories. 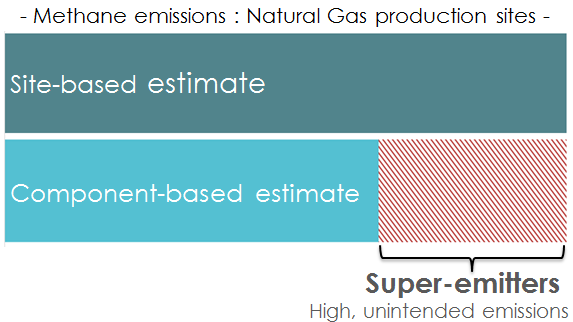 The insufficient contribution from the components or operations that can produce high emission rates when operating “as designed” is indicative of the existence of abnormal process conditions (such as malfunctions or equipment issues) that create pathways for substantial unintended emissions of produced gas. Routine operating conditions do not explain high-emitting sites. We can now hypothesize that not only is gas escaping, but when and from which sites is constantly changing. And frequent, or continuous, site-level monitoring is required to help us find and reduce waste from super-emitters. Because our new work tells us that super-emitter sites are characterized by abnormal behavior that is unlikely to persist indefinitely, we expect that different sites will be in the high-emitting group at different points in time. Industry claims that most super-emitters are sites with liquid unloadings or tank flashing, but these routine operating conditions do not explain the number of high emitting sites at any moment in time. Our new work tells us that these emissions are coming from unintended malfunctions throughout natural gas development and production. Additionally, the EPA’s Inventory, which is based on component-level emissions data, is significantly lower than actual methane emissions, due to the omission of super-emitter data from production sites. Specific sites could be affected by abnormal conditions resulting in their being a super-emitting site at varying points in time. As a consequence, rather than looking to control emissions from a few sites, minimizing emissions requires monitoring approaches that enable efficient and timely responses to the unpredictable nature of when and where a super-emitter will be located. Current standards for intermittent methane leak detection and repair will continue to miss many of these super-emitting sites. We must have an effective program to continuously monitor for methane waste.